Arguably the best meatball sandwich you will ever try. 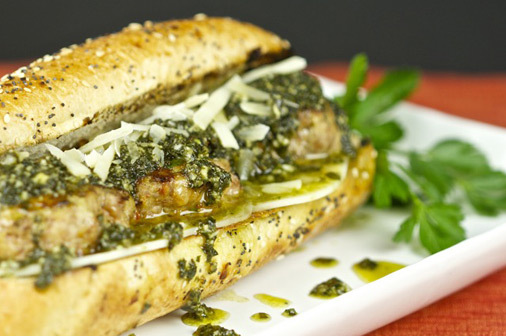 You will not be disappointed with this new twist on the classic meatball sandwich. Perfect for lunch or dinner. Preheat the grill for about 30 minutes. Take ground meat in a bowl. Drop in half of the parmesan cheese, ricotta cheese, salt, pepper, fresh flat leaf parsley, dried oregano, red pepper flakes, minced garlic, panko crumbs and eggs. Shape the meat into balls and flatten them a bit. Drizzle some oil on the island grillstone and place the meatballs on the stone. Cook until the meat reaches 165 F.
Toast the buns on the island grill stone. Layer the buns with the provolone cheese slice. Arrange the meat balls on top. Drizzle pesto on top and sprinkle parmesan over the meatball.